Great emphasis is placed on safety in Pasadena, a suburb of Houston, Texas. As America's oil stronghold and home to NASA's legendary Space Center, the region is famous for its particularly dangerous and hazardous working conditions. The Houston Area Safety Council (HASC) was therefore established back in 1990 on the initiative of local industrial operations as a non-profit institution to provide safety training. The objective here was to train workers in order to raise their safety awareness as a way of preventing workplace accidents. Some 25 years later, this idea has developed into a leading international training and occupational safety center that trains over 1,500 people every day. Construction of a dedicated occupational health clinic with emergency care represented another key step on the HASC's holistic support program. 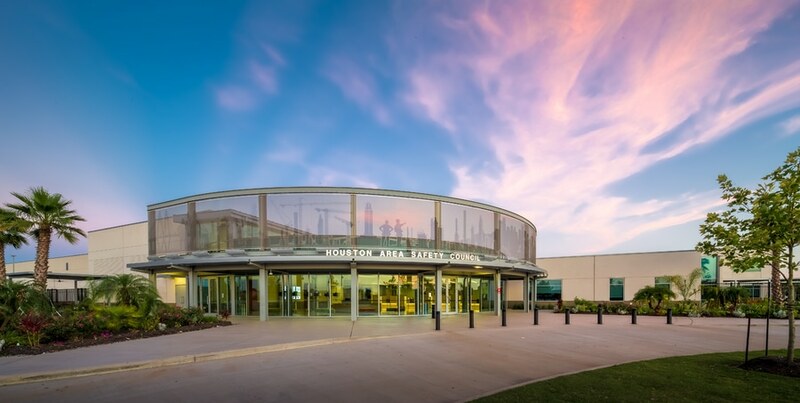 The clinic design by Kirksey Architecture gets its distinctive face from the semicircular main entrance. GKD-USA used a new etching technique for the design of the 100 square meter roof parapet, which is made from semi-transparent Omega 1510 stainless steel mesh from GKD – Gebr. Kufferath AG. 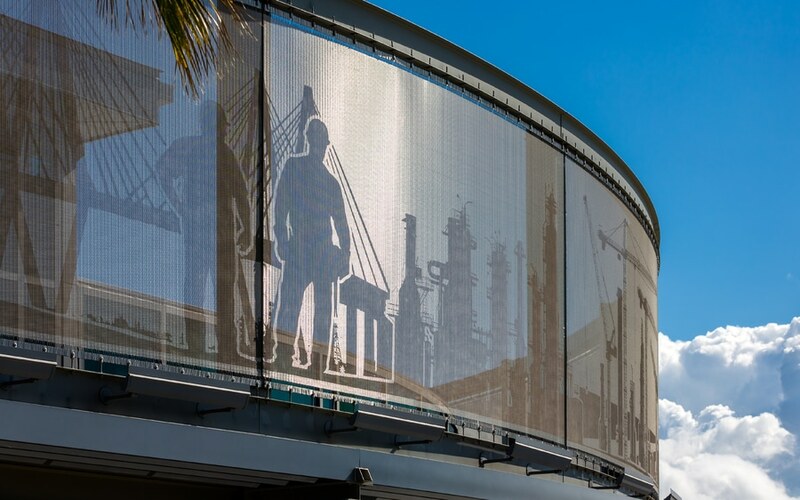 This led to a silhouette-like panoramic view that reflects the dynamic economic region and the everyday working life of the people that live in it. Oil and gas have been produced in Houston for more than 100 years. However, the region experienced a genuine boom from shale oil drilling and fracking. Today, around one third of all oil produced in the US comes from Texas. With its Mission Control Center, which has enjoyed worldwide fame since the Apollo flights to the moon, the Space Center Houston has been just as important for the development of the city. Space flights are still monitored here to this day and astronauts from across the globe are trained for future missions. 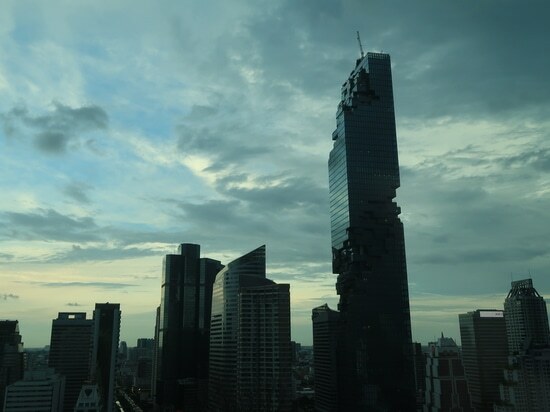 The city's skyline is characterized by massive production plants from the oil, gas, chemical and food industries, as well as research institutes and countless buildings of the supply industry, construction and service sectors. The huge influx of workers resulting from the oil boom led to enormous growth of the city. With 2.3 million residents, Houston is today the fourth largest city in the US – behind New York, Los Angeles and Chicago. Starting in 2009, the new campus of the Houston Area Safety Council was created in three construction stages. It was constructed on a 34 hectare site in Pasadena, just 15 kilometers from Houston, that was acquired one year previously. Local architecture firm Kirksey, which specializes in green buildings for industrial operations, planned the entire project. 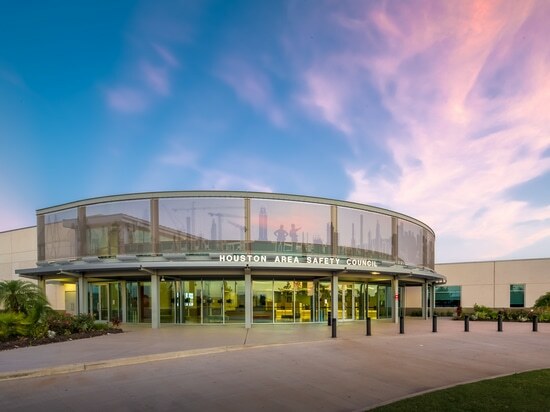 It designed the campus as a one-stop shop for employee selection, training and development, background screening, workplace and site safety as well as company health and welfare services. 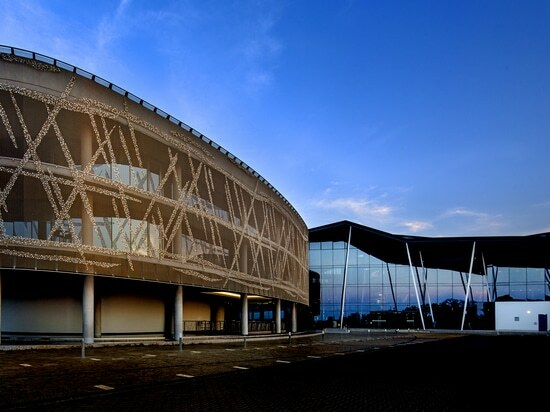 The first phase of construction focused on the 6,300 square meter training center with twelve classrooms, a 220-capacity auditorium, computer laboratories with 650 workplaces, various convention and common rooms, as well as a car park for 1,000 vehicles. It was opened in 2013 as the new HQ of the HASC. Just one year later, the campus then opened two further large areas, boasting 2,700 square meters each. Providers of tool and workplace equipment, as well as a training center for practical training, complemented the location's offer from then on. Construction of a 1,580 square meter occupational health clinic with emergency care marked the third and last major construction phase to date. This meant that within a period of just six years a state-of-the-art campus employing the latest training facilities was established, offering 1,500 practical and computer-based training sessions every day – which represents over a million units per year. To cater to these requirements all buildings were equipped to the latest technical standards. They also set standards in ecological and energy-usage terms and are all LEED-certified. The Occupational Health Center of the HASC was also planned with a keen eye for detail. Ceiling-high windows create friendly rooms in the clinic that are flooded with light and whose inviting ambience is underlined by a carefully coordinated interior color concept. The challenge for the planners was to make the atmosphere light and pleasant, yet robust enough to withstand the rough day-to-day operations with heavy footwear or soiled work clothing of the patients. A fully-glazed semicircular entrance area underlines the building's welcoming effect. Its raised canopy bears the clinic's name and also creates the stage for one of the rooftop parapets made of stainless steel mesh that follow the semicircular building form. The shimmering texture combines technical aesthetics with a large number of functional performance characteristics. 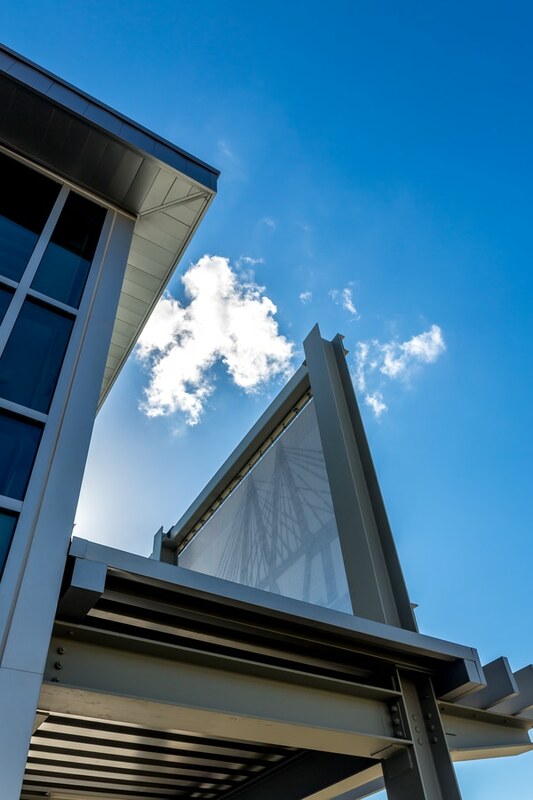 The mesh thereby guarantees efficient solar protection for the recessed windows on the top floor, while granting unrestricted views of the beautifully sculpted green spaces on the campus. Despite its sophisticated appearance, it also offers reliable protection from the hurricanes regularly encountered in the region. 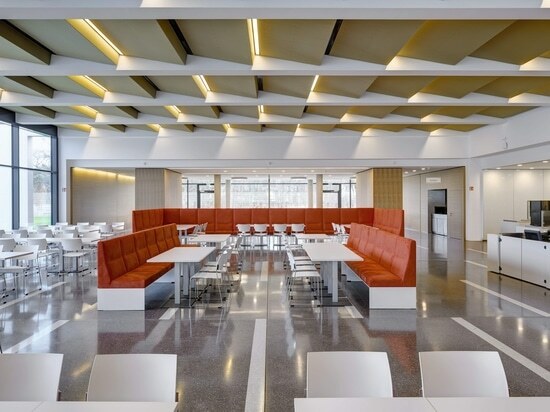 Low-maintenance, durable and almost completely recyclable at the end of its useful life, the mesh supports the LEED-certified sustainability of the building. For the architects, however, the decisive impetus for selecting this material came from the specific mesh design, which facilitates imaging by etching. Their design included an illustrated balustrade as an identity-creating element of the clinic that visualizes working life in the region and thereby also the focus of the HASC. The image developed by Kirksey shows the skyline of Houston with skyscrapers, drilling rigs, chimneys and cranes together with the people that work there. 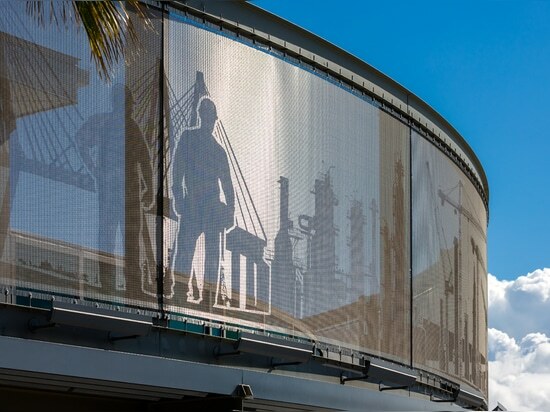 This complex perspective was applied to the stainless steel mesh in a silhouette-like form using a special etching process developed in-house by GKD-USA. The smooth surface and relatively tight structure of the Omega mesh provided ideal prerequisites for this. Using blasting abrasives, GKD modified the metallic surface in such a way that the template, which was highly filigree in places, appeared finely contoured. When using etching, all surfaces that are to remain untouched are usually masked off carefully. However, the complexity of the motif specified by the architects at Kirksey presented the mesh specialists with the challenge of designing multiple levels to lend the image the desired spatial depth. Unlike a painting, with etching it is not possible to achieve dimensions, perspective and depth simply by using different colors. 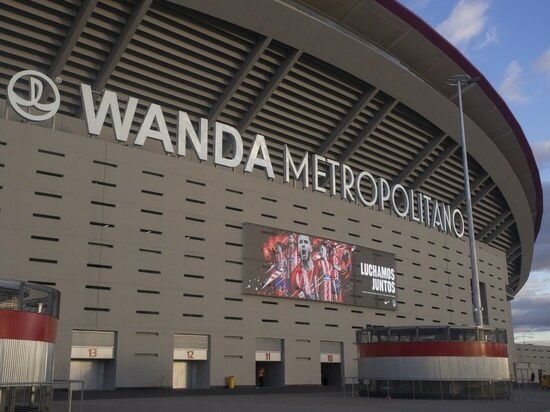 In comprehensive tests, GKD therefore developed a process with which the design template could be blasted with the desired level of detail and spatial effect. 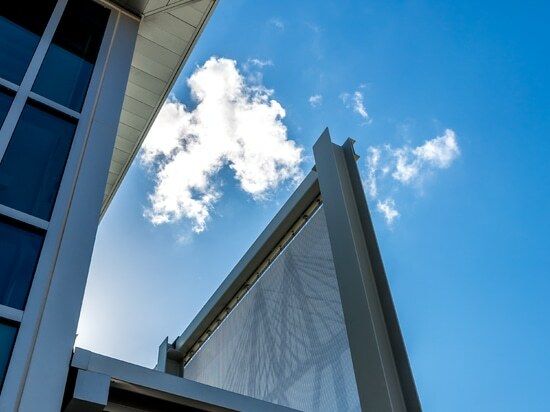 This led to a visually seamless panoramic view of the hustle and bustle in the region over a total area of 100 square meters, comprising seven panels – each measuring 3.4 x 4.3 meters. Without any further surface treatment, this imagery is both permanently weather-proof and UV-resistant. Depending on the incidence of light and the viewing angle, the images can appear either transparent or opaque. At night, spotlights lend the scenery the appearance of a shadow theater using targeted light accents.